We are staring up work sessions for our equipment. If you want to get involved, now is a good time. We have a lot to do and as with any Volunteer organization, we can always use a extra set of hands. If you wish to join and help out go to http://www.877trainride.com and go to the Presidents page and click on the link to Volunteer or go to http://www.877trainride.com/getinvolved.htm. We will send you a application to join. It doesn't matter if you have prior experience or not, we will be more than happy to teach you or you can show us! The good ! 2010 looks like it will once again be a great year for the group, there are many different projects in the works. We have Thomas returning again in 2010, If all goes well The M-1, 45 ton GE and some new rolling stock will be out and in service by then. As John pointed out in the last quote, were looking for more help like always. Anyone that can be safe is welcome, no experence necessary. There is something for everyone to do here and this is a great time to start. This weekend, 142 parted ways with tender on Saturday, she is in the shop for her annual go over. This is a great thing to see, I truely beleive this locomotive is in better shape then she ever has been in the last 15 years. Our CMO has been in place now for 5 years on a full time basis. His preventive maintenance program is really starting to show. Every year parts of the loco are getting a serious overhaul weather they need it or not. This shows in the reliabilty of the engine even with the fact that it's run ever weekend most of the year, the diesel hasn't had to fill in once in over 3 years. More good ! From the 45 tonner shop ( The tarped garage ) if your going to get involved with this one bring shorts with you ! Saturdays high was around 25 degrees, with the heater on the lowest setting it has the work area was over 90 degrees by 10am ( we had to open a cab window ). We felt bad for the guys in the shop, it was only 60 in there. Now comes the Bad and the Ugly ! It was a sad day for me and few others, not the end of the road or anything, just a set back. As we took the engine 1 down to the bare block looking for the problem, we found parts that looked as new as they should in a motor with 10 hours on it. Then we pulled the timing cover and found our problem. It's a sad thing for this old girl, factory cummings guys came out and rebuilt her for service she never saw. But her stack wasn't covered properly and she took on water. I'm not sure if were going to rebuild what we have top to bottom or look for for a fill in motor for the moment. I just know we want her out on road painted and all ASAP. If anyone knows the whereabouts of a Cummings HR type diesel ( straight 6 no turbo ) please reach out to me. These engines were the 350 chevy of cars. They were in locomotives, cranes, tractors, truck, generators and so on. Everything from the 1940's to the late 50's. This pic shows the water damage in the front of the motor. Last edited by Donko142 on Mon Jan 11, 2010 6:34 pm, edited 1 time in total. I have ressurected Ford gas engines in worse shape than that! True the bearings and gaskets are probably gone but those parts are available. Unless you can find a reliable running replacement, you might just wind up wih an engine in worse shape. I'd stick with the rebuilt unit you've got there. I have rebuilt a quite a few old auto engines. 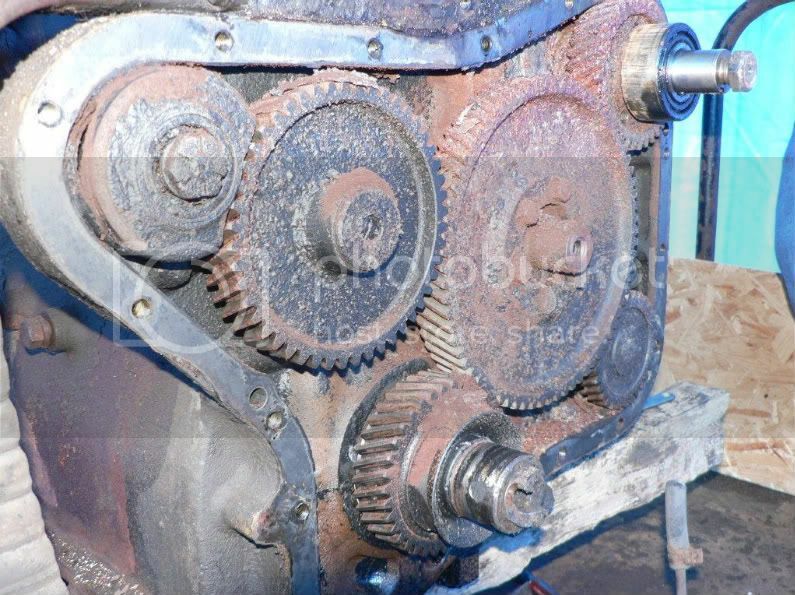 I have never seen timing gears as bad as the ones in your picture. BUT -- I hope you will probably be able to find another non running engine. With luck you can use a lot of parts off it and make one good one out of two. This is the way I had to did it sometimes to save money. Hopefully the word will get out and you will find something cheap. I am very familiar with the sick feeling you get when you open an old engine and find the worst. You will win, it's going to take time. Jim. Remember look at the big picture, just because there's not a second steamer here it doesn't mean things aren't happening year after year. It is an unbelievable amout of work. Each Year there's more special trains running, Wine trains, Polar trains, Easter trains, the Mine was a large investment that was worked out well for the group with riders having there choice of the Mine or the Corn maze. Last year we picked up another 1500ft of class 2 track, like most years we pick up something. One volunteer bought a back-hoe to help with ROW work, One bought a classic GE diesel. We will be working at least 2 or 3 days a month in the Butler shop, the M-1 needs about 20-30 hours of work to be ready for the move to Phillipsburg. The hood for the # 1 side of the GE is ready for pick up. 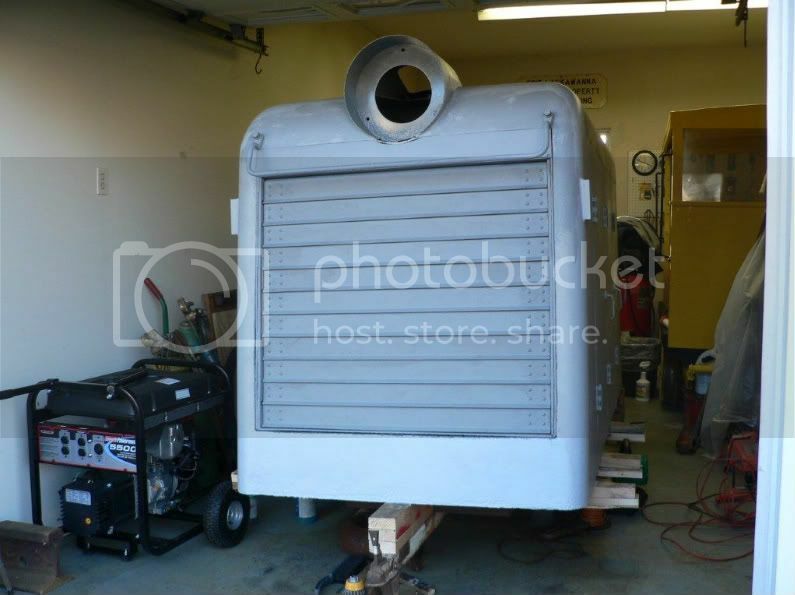 ( as seen in pic ) the whole hood was down to the metal, doors & headlight removed and painted inside and out. I think the hardest part wes getting all the louvers apart sandblasted and operating freely again. Were should have #1 picked up and # 2 coming off with-in a month. Lots of projects going on and this time of year. This thread is for posting news and discussing the operations and activities of the volunteers who operate passenger trains on the Bel-Del Railroad. If you have questions about their policies or other non-operations activities, please start a new thread. One of the new projects were going to be starting on real soon is a small, but important one. If you have been thinking about getting involved, but can't do hard labor or don't have any railroad experience. This would be a great break-in project. Simple and small. We just got a third bi-level from Butler a few months back, the air is all up to date the car just needs some TLC inside. The heat works and it's dry inside to start with ( work friendly ). Step 1, it really just needs a good cleaning, with 4 guys taking there time and telling railroad stories, it should get done in 1 weekend, no problem. Step 2, 8 to 10 open windows need to be installed. I will be the first to say I was not a fan of the open window idea in the bi-levels. ( that's also why I wrote in the last post everyone's opinion counts with this group, we think about the ups and downs of everyone's opinion. I lost that one and I'm glad I did ) I was wrong with my opinion in that matter, after seeing the windows installed from the inside I loved them. Trust me until you ride in a open window bi-level on floor 2 and see (and hear )for yourself, it's the best view in the house by far and now my first choice when I ride with friends from time to time. Step 3 ( in April ) the car needs to be sanded and painted for service. This car is a must for the July Day out with Thomas event. If anyone is off during the week, next Thursday we will be getting together on a small road trip to look over some equipment on another Railroad. Then back to the shop at Baer to make a game plan for project # 2 which will also start soon. Be safe, thanks for reading. I wish it was going to be warmer tomorrow. Looks like there's enough of us to make a trip to PA, then a loop through NJ. A couple of our NJT engineers are off tomorrow, plus a few new guys looking to help get involved, Peter and myself ( that's enough for 2 pizza's in Milford). So were off on the start of an open car project. Our Flat car was picked out and moved down to the shop in Baer. We should get some good info and pictures tomorrow so we can get THS 2010 project # 2 underway ASAP. This is another thing thats a must for the Thomas event. There are a few people that can't wait to get started on this one. My goal is to organized 3 or 4 small groups ( approx 5 people ) and let them take on their project of choice and run with it. Between our CMO, Gary working Thurs- Sun, the NJT guys working extra board, retired guys, people that work the police/ fire schedule and so on, we can have work parties on almost any given day. The M-1 should be getting back in the rotation soon so we can get the move done. Stay warm tomorrow !!!! If your off and want to go for a ride reach out to us. Be safe ! After starting 3 hrs last due to the weather, we still got what we needed to do done. Fred, Rich, Rob, myself, Larry and his friend Jeff made it to the the Black River to look over the outstanding job Scott and the BR guys did on their beautiful (flat ) open car. ( WK&S wasn't going to happen due the late start ). After a stop for lunch and a look around the RR in Milford, we made it up to the Baer shop to find Gary and Pete Lerro ( lerroproductions.com ) working on 142. We looked over our notes and talked about everone's different opinion and made a start date of next week to hit it hard. Rich and Rob started clearing the flat right then and there and worked till about 7pm. ( that's motivation ! ) This was an old Conrail wrecking flat, I'm sure it has a better life ahead for it. Watch for update info. Things are moving right along on the GE, the engine parts have been located and a deal is being worked out to get them to NJ as I write. I'm really thinking this is going to be a well above average rebuild on the whole unit. The # 1 rusty hood is ready for color as seen in previous pics thanks to the Dorn's. The engine is getting a complete rebuilt top to bottom. The owner's of Denville Bear & Body are going to lay a serious paint job down for me in the spring. 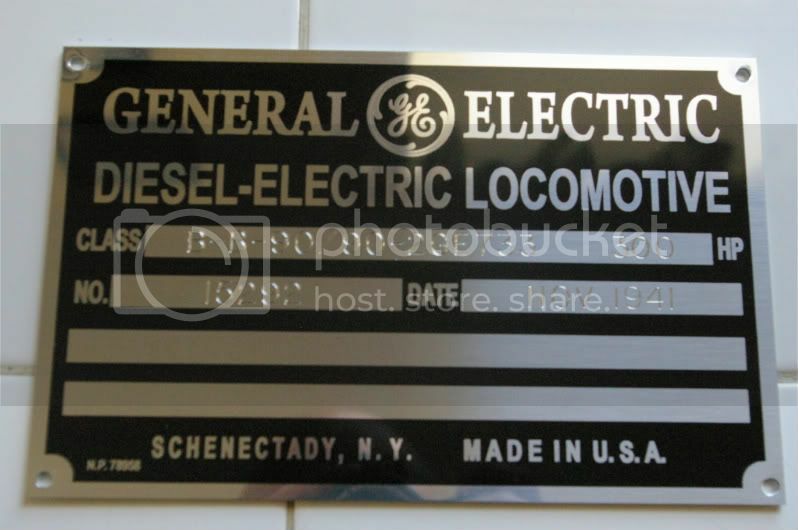 A local shop in Morristown made a BEAUTIFUL set of repo builders plates as seen below. ( missing 1 orig ) I'm just thinking on a good color for the painter. Pullman green, maybe the original yellow with a little black added in, something with some PRR heritage as it been on the PRR since new in 1941. Who knows, but it's coming along pretty good for now. On Friday 2-5-10 a group of us will be working on project # 2 the open car. We will starting around 9 am ( if there's rain, snow or high wind will head inside the shop ) I'm hopeful we can get the floor cleared, cleaned and ready for the wood to go down. A trip to the lumber yard should happen on Friday. Like always new members/volunteers are welcome and needed. Our operation is growing year after year ! Thanks for your time and interest, be safe. This has turned out to be some week off, 3 long days of anual training classes at Steamtown. Tomorrow we will be working on the open car as planed. If the weather gets to cold or the wind starts we will be moving into the GE or the shop to help on those projects. We will be meeting at the Baer shop 9am. Weather is looking good so far, cold but no wind or snow. The generator is set up next to the flat to provide power, plus the Back-hoe is also there making it easy for the garbage, just toss the scrap in the bucket for easy clean up. Hope everyone has a good weekend. Off the path of the Bel Del for a moment, found these pics in a down load. 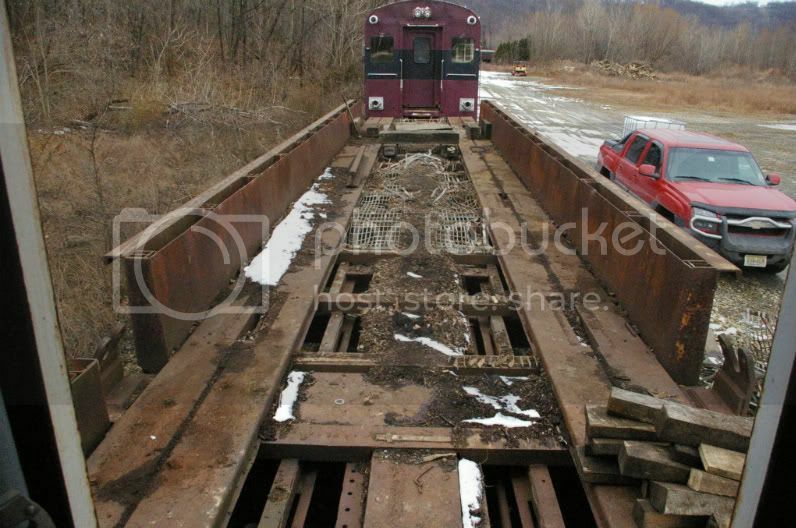 This picture was taken 12-3-09 at the Scranton yard. 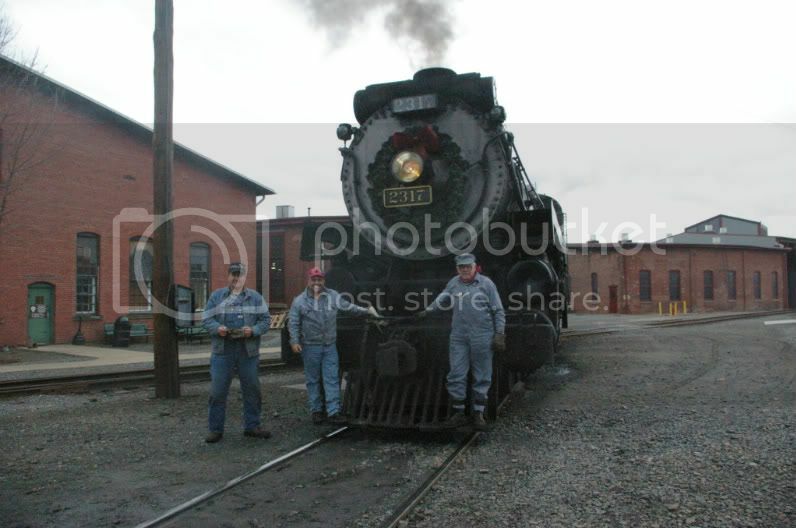 Shown is 4-6-2 CP 2317 and ( from L to R ) Bob Paterson, myself and Don Young ( also a very active volunteer on the Bel -Del ) This was a sad day, this was the last regular week of operation for the 2317, her 15 year overhaul is due and there's no plans ( or $$ ) to put this BEAUTIFUL locomotive back in service at this point in time. For Don and myself it was most likely the last time we will very get to pull back on her throtle or control the many firemans valves that have put smile's on the faces of so many people ( myself at the top of the list !) I have been so very lucky in my time. 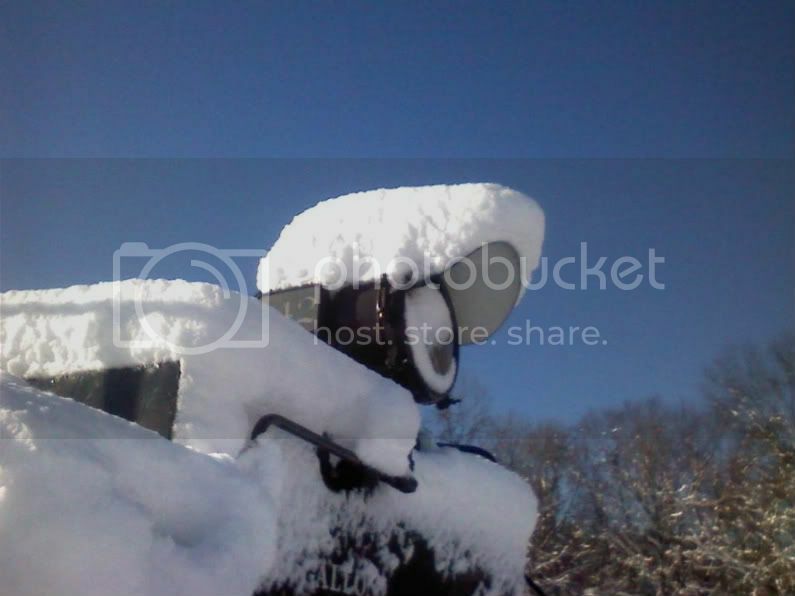 I've had the opportunity to operate many steam locomitives, this one was truly one of the best, simply put, " it did everything well "
On to the Bel Del, the snow storm hit the shop leaving approx 5 inches. Friday's work party was lite due to the storm and NJT hiring off the extra board. The platform of the open car is about 1/2 cleared off. ( Pictures to follow ). Don Young, Doc and Gary were working in the shop in the smoke box of 142 and removing the injectors for inspection. Work will be on going on Thurs-Sun this coming week. The starting point. The following pic is of the open car to be. One can notice that the metal grating has been removed from about 40% of the cars floor. The new floor and wood sides should be going on by March. Were open to opinions on a color for the car ? Keep watching or get involved, some new improvments to the operation will be turning up soon. It's like X-mas all over again for me and some others. THANK GOD FOR THE INTERNET !!!!!! To find parts like this years ago would have been impossible. Cummins stopped making the H model engine in the early 60's. My loco was built in 1941 with H6's @ 150hp and the orig cummins fuel injection system. At some point in the early 60's JCP&L upgraded to HRI's (mine are from 1956) @ 180hp with the much improved PT fuel system (743CID). After looking around the tri-state area with part numbers in hand, all I got was " are you crazy buddy, they haven't made that in 50 years " But I found a guy on the net, that knew a guy, that knew another old guy in WI into old tractors. (Santa Claus) As this picture shows he was a cummins dealer at some point and had the parts for me to rebuild the engine 3 times over. 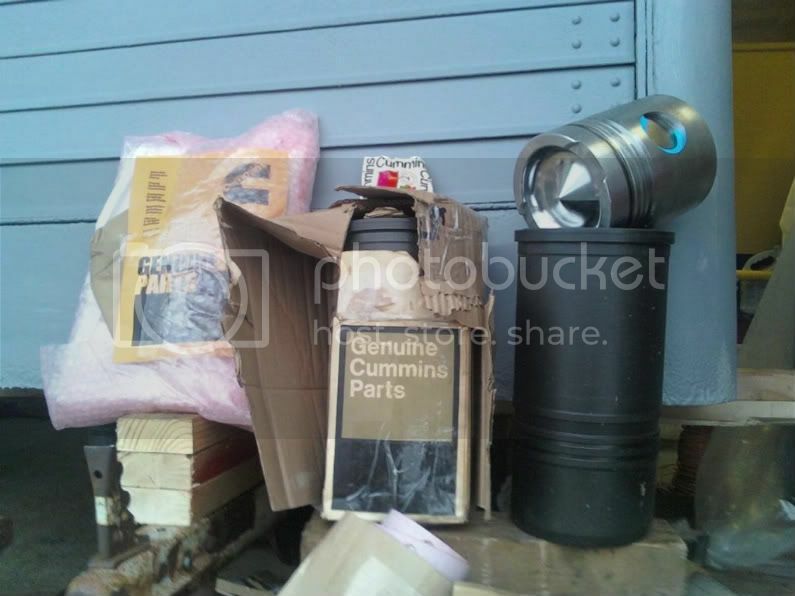 My new pistons, liners, rings, rocker boxes and gaskets all arrived in the orig cummins boxes as promised. Pro Motion Engines in E.Hanover will be hot tanking the block, going over the heads and so on. I had found a few used engines in the $5,000.oo range, But Keith, Gary and myself felt spending that much money on mine would give us a fully rebuilt HRI top to bottom with 0 hours on it. Keith Dorn was a huge help with these engine parts and the engine removal. Like always things take time ( and my cash flow is getting low lol ) but we can't wait to see this lil loco pulling that open car or two later this year. This project along with the open car prject and the steamer ( plus some new stuff that will be noticable shortly ) are all moving along at a good pace ! More proof the volunteers down here are walking the walk month after month with noticable improvements. They're not just talking the talk ! When someone states " we can't do that with out lots of money, big time equipment and a class 1 shop "
I think that makes people want to do it more ! By March were hoping to get on the ROW cutting. Always room for more help down here. Finding these parts was a HUGE step in the rebuild of this old girl !!! Thanks for reading, have a good weekend. Due to the 12-17 inches of snow the railroad got during the storm on Wednesday, the open car project will be on hold for a week or so. 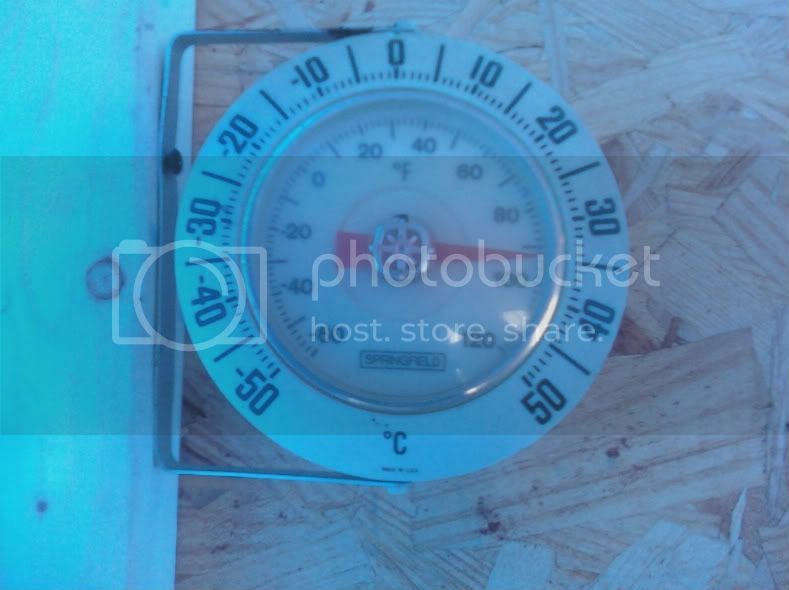 Work will be on going inside the warm shop on 142 on Fri, Sat, Sun. Everyone have a good weekend.